Care to share a little inspiration? Re: Care to share a little inspiration? Those are ALL pretty sweet! Interesting how much variety there is. I've seen so many bikes online that I've become extremely selective about what I like. Not many bikes turn my crank these days but this sure puts the lead in my pencil. Everything is just right on. I think I may have to borrow that one for a while! Awesome!! You know, I'm not really a "Brit Bike" guy. They really don't "get met going" for the most part. 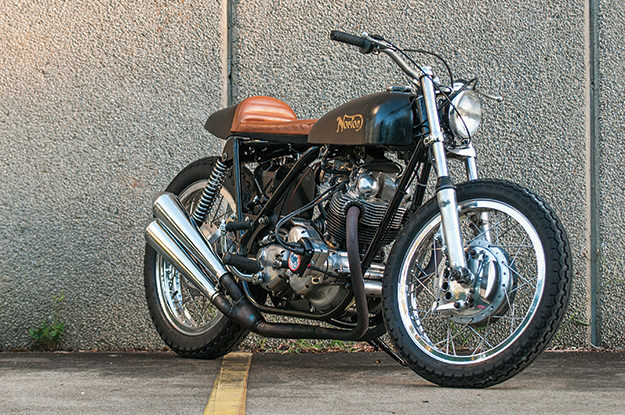 THAT Norton, however DOES have something special, doesn't it?!?! I think I could get pretty cranked up about something like that one. I experienced my first track day this summer. They're really fun, no doubt about it! I'm gonna "borrow" most of these for the days and weeks ahead!! Thanks! !